German cooling expert Stulz has launched a chiller that relies on a recent, eco-friendly refrigerant called R-1234ze. R-1234ze has lower global warming potential (GWP) than older refrigerants typically used in data center temperature control, like R-410A and R-134a. The CyberCool 2 ze series promises to lower environmental impact of customers’ digital infrastructure while complying with European Union rules, now and in the future. R-1234ze or hydrofluoroolefin (HFO) is a ‘fourth generation’ refrigerant which has zero impact on the ozone layer and a very low GWP. The compound is fully compliant with EU regulation no. 517/2014 on fluorinated greenhouse gases, which aims to phase out the use of refrigerants containing hydrofluorocarbons (HFCs), especially in industries where there are safe alternatives. 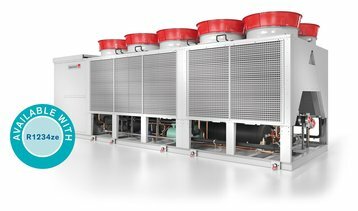 The latest chillers from Stulz combine R-1234ze with the well-established CyberCool 2 hardware, originally launched in 2013. The new chillers are available in capacities between 300kW and 1MW, and are designed to be used in traditional air-cooled data center environments, with support for indirect free cooling. Stulz says they have been equipped with “largest possible EC fans” to increase efficiency, while compressor chambers have been insulated to reduce noise emissions. The new chillers also feature microchannel condensers constructed entirely of aluminum and air baffles to guide the airflow, boosting efficiency further.